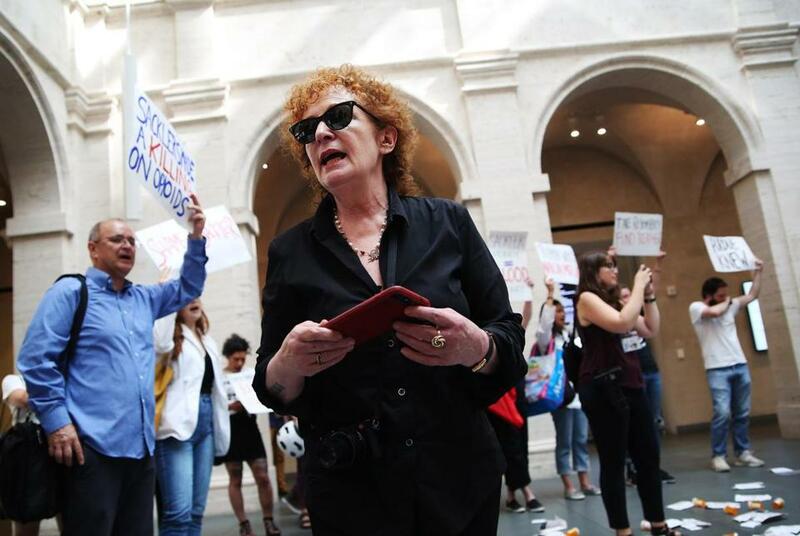 Photographer Nan Goldin led the protest at the Arthur M. Sackler Museum. CAMBRIDGE — Anti-opioid activists called on the Harvard Art Museums to cut its ties to the Sackler family in a protest on Friday at the Arthur M. Sackler Museum. The protest, led by noted photographer Nan Goldin, was organized by students at Harvard Medical School and activists at the Opioid Network, a national coalition of some 45 advocacy groups. Protesters — who came from Greater Boston and New York City — marched in a circle with signs: “Sacklers must pay,” “More deaths than the Vietnam war — no more,” “Oxy kills.” Some three dozen museum patrons looked on from the upper floors. The museum’s benefactor and namesake was a psychiatrist, art collector, and revolutionary drug marketer who in 1952 helped his brothers finance the purchase of the company that would become Purdue Pharma. In 1996, Purdue Pharma — based in Stamford, Conn. — launched OxyContin, an oxycodone-based drug that has generated tens of billions in sales and been widely accused of fueling the opioid epidemic. The Harvard Art Museums comprise the Fogg, Busch-Reisinger, and Sackler museums. The activists then staged a “die-in,” in which they fell to the ground as a group to commemorate the deaths due to opioids. Arthur Sackler died in 1987, nine years before the distribution of OxyContin. According to The Guardian, Arthur’s branch of the family is estranged from the descendants of his brothers. Sackler made his fortune marketing drugs like Librium and Valium. He pioneered clever and ethically dubious techniques to market addictive drugs directly to doctors. His techniques were later used by his brothers to market OxyContin. In February, Purdue Pharma announced it would stop marketing opioids to doctors. According to organizer Leo Eisenstein, a fourth-year student at Harvard Medical School, the protesters want the Sackler family to use its resources to improve access to naloxone, to medication-assisted treatments like methadone, and to harm reduction strategies, such as needle exchanges. Goldin, a photographer known for her depictions of drug use and transgressive subjects, grew up in Lexington and has some four dozen photos in the Harvard collections. She recently recovered from a three-year OxyContin addiction, for which she sought treatment at a Massachusetts rehab facility. Activists said that this was the fourth protest of its kind targeting an art gallery or school named after the Sackler family. The Sacklers have their names on spaces at the Louvre, the Royal Academy of Arts, the Smithsonian, and the Guggenheim in New York, among others. The Center for Popular Democracy, the nonprofit that supports the Opioid Network, also participated in Goldin’s protest at the Smithsonian Institution’s Arthur M. Sackler Gallery in April. A spokesperson for the Harvard Art Museums declined to comment. Graham Ambrose can be reached at graham.ambrose @globe.com.